UPDATE: Ryan Grove has a better script to display the JSLint results. So basically follow the instructions here until you get to Step 2, point 5 (where you write the command to run JSLint). Then head over to Ryan's blog post to get the better script. While on PC I integrated JSLint with my text editor of choice - TextPad - and shared here. Now, ladies and gentlemen...[drum roll] I give you...[bzfghgang!] JSLint on the Mac! The Rhino version of JSLint is here. It's just one JS file. Find an appropriate place to copy it, I think ~/Library/JSLint is as good as any. 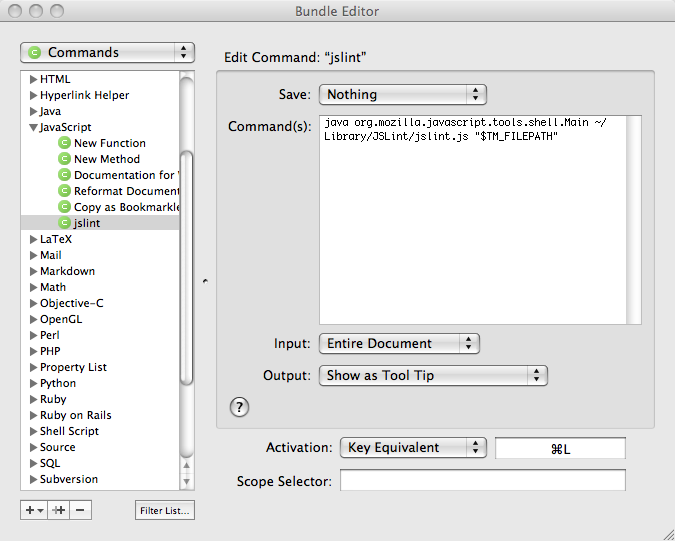 TextMate extensions work their magic through the so called bundles. Here's what you do. In the Input: dropdown select "Entire Document", in the Output: "Show as Tool Tip" or "Show as HTML"